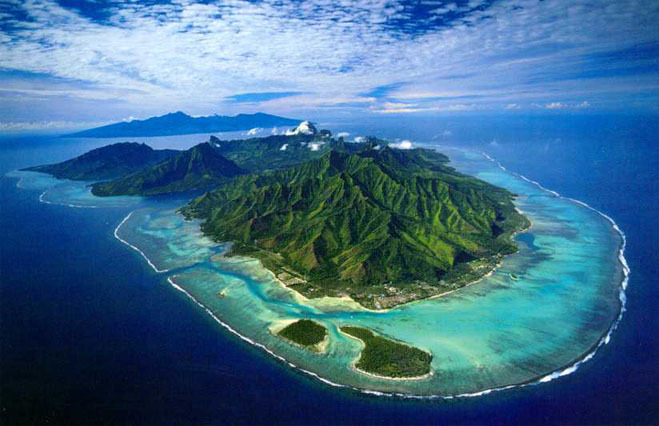 Moorea, which has often been linked to James Michener’s mythical and idealized island of Bali Hai, is only 17 km (12 miles) from the main island of Tahiti. Here, the volcanic peaks soar magically out of the ocean in an explosion of green velvet and reflect in the tranquil waters of Cook’s Bay and Opunohu Bay. A wide, shallow lagoon surrounds the island’s mountains where poetic threads of waterfalls tumble down the cliffs. Pastel-painted houses surrounded by gardens of hibiscus and birds of paradise, circle the island in a fantasy of happy, yet simple villages. It is a relaxed, barefoot existence that prevails and there is real ambiance here. From warmth of the air scented heavily with tropical flowers which blanket the valleys to the fiery romantic sunsets that signal the end of another fabulous Tahitian day. We have daily travel deals we would like to share with you, so give us a call today to find out about today’s special! This entry was posted in Destination Wedding and Honeymoons, Hotels and Resorts, Moorea, South Pacific, Weddings/Honeymoons.